The apply only labeling heads from LSI apply pre-printed pressure sensitive labels to your products. 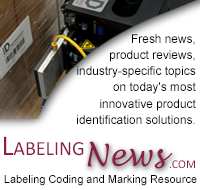 If you are looking for decorative labeling systems, LSI offers the Series 40 and the e300. Enhance your products with an apply only labeling head. The apply only labeling head Series 40 is designed for ease of handling. If you need a machine that can handle your labeling needs, the Series 40 is built tough. In LSI’s performance line of stepper motor driven label applicators, the Series 40 includes user adjustable dispense speeds up to 1200-inches of label web per minute. With speed and precision, this apply only labeling head ensures quality and efficiency. Take labeling application to a whole new level. The Series 40 is available in either right hand or left hand configurations and is designed to work with any of LSI’s standard applicators. If you need custom configurations, allow LSI to meet your needs. The Series 40 is geared toward all shaped and sized products. Ensuring your products are aesthetically appealing, without sacrificing function, LSI labeling heads are designed with precision in mind. The decorative label applicator e300 is a cost effective means of meeting your labeling needs. Providing you with reliable, durable machinery is the goal at LSI. When you need innovative equipment, look to the decorative label applicator, e300. The e300 includes a brightly lit, touchscreen display and a modular design. Achieving speeds up to 1,000 inches of label web per minute, the e300 rises far above the competition. Whether you need to apply labels to recessed areas, indexing lines, or variable speed lines, the e300 is available for your labeling needs. When you need effective solutions to your label application needs, LSI provides plenty of options. With the Series 40 and e300 apply only labeling head machines, your labeling solutions are quickly and effectively met. Enjoy the cost effective, high performance, value labeling heads from LSI. If you need a customized labeling head, allow LSI to work with you to ensure you receive the exact machine you need. To see Labeling System's apply only labeling heads in action, watch our videos from our gallery.